Near the end of May is National Multiple Sclerosis Day. I have met a wonderful lady who has this disease and conquers it every day. She has written a book about her life. It is an amazing story by Eva Marsh called Black Patent Shoes Dancing with MS. Go to her website and order it. It will make you laugh and cry and rejoice with her. You will learn a lot about this disease in a fun, entertaining way. If you need a speaker for your group she is the lady for you, always upbeat, insightful and fun. If you need help organizing because your health may make some tasks difficult, call me and let me be of service to you. 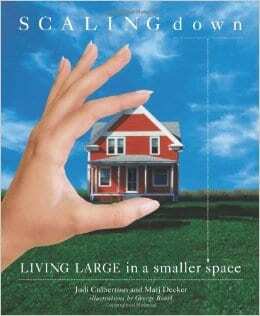 This is the name of a book that can help people with ADD to get organized. It can also help other people to understand how they can assist someone with ADD get organized. The person without ADD acts as a coach. Each chapter suggests strategies and processes for a person with ADD to try. Then the chapter continues and explains how a coach, friend or family member can assist. 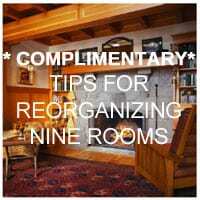 The last part of the chapter explains how a Professional Organizer would work with the client. The book is written and formatted so it is easy for a person with ADD to use. The sections are short. There are circles and boxes, headings and bullet points and a review section at the end of each chapter. 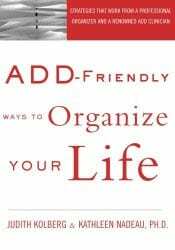 Judith Kolberg, a Professional Organizer and Kathleen Nadeau, a Psychologist have collaborated to create a book full of strategies that work. What has been a helpful resources for learning about organizing skills? Pinterest can be a great resource. It has ideas on how to organize everything and anything. It has DIY solutions in all price ranges and skill levels. Pinterest is good resource for visual learners, you see the design on your screen. So why don’t I like it? The problem that arises for me, as a Trained Professional Organizer, occurs when clients see something on Pinterest and ask me to create that system for them. Just because it is on Pinterest doesn’t mean it is the right solution for you. It is the right solution for the person who posted it. Evaluate the idea and think about how you do things before you copy it. Just because you like the way it looks or because it is trending doesn’t mean it will work for the way you think and do things. Deciding how to organize your books, jewelry etc needs to be done in a way that you can find what you need, when you need it and in a timely manner. 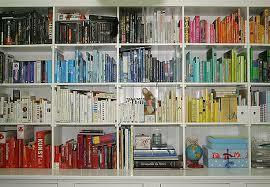 Organizing your books by colour looks great on the wall but will you be able to find a book you need. If you did it with a small number of books or only pick 2 or 3 colours of books you could adapt the idea and make it work. If you organize your jewelry hanging it from the horizontal bar of a hanger using binder clips to attach the jewelry if may be a good solution if you don’t have a lot of jewelry. If you hang all your jewelry and then slide the hangers on a rod to look for a certain piece of jewelry the jewelry might become tangled as they sway when the hangers are moved. How would you attach your rings? You might end up this your jewelry stored in many different locations and not be able to find what you want. 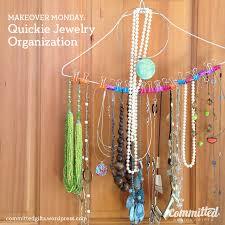 If you have a small amount of jewelery and a space on your wall to place your hanger this might work for you. A recipe may look great. Is it something you can make in a big batch and freeze so you can get 2 meals for the time you are spending in the kitchen? Are the ingredients something you have in your cupboard or will you need to make an extra trip to the store? Enjoy using Pinterest but use it wisely to help you save time, money and effort.